People are excited about periscope cameras – last week’s poll shows that the high zoom levels they enable will be a key consideration the time comes to buy a new phone. There are plenty of phones with a tele camera on the market right now, but they are almost exclusively 2x. 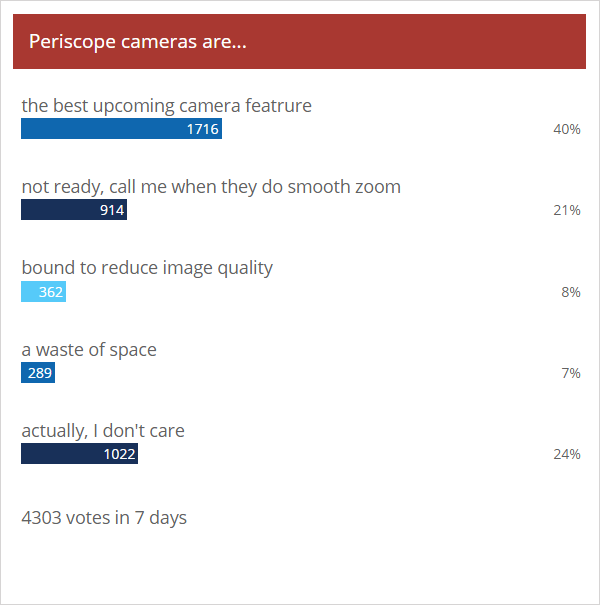 From the comments it’s pretty clear that the excitement about periscope cameras will be much higher if they offered smooth zoom. There have been such cameras in the past (e.g. the Zenfone Zoom), but the upcoming crop of phones (e.g. Huawei P30 Pro and Oppo Reno) will have a locked focal length. People are concerned about image quality, especially in the dark. Periscope modules have relatively small sensors and slow apertures, which makes it tricky to get a good quality photo. But we’ll reserve judgment until we play with the P30 Pro (due to be unveiled on Tuesday next week) and others. I believe the main sensor used on Huawei is the first step. It should be a 1/1.7" 40Mp quad sensor. Hopefully it can be improved in the future generations to catch up those used in cameras.